What is a teacher profile? 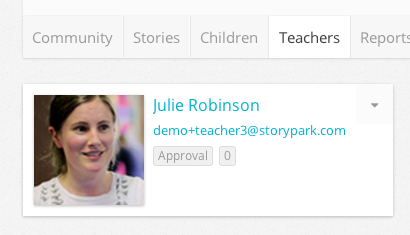 Teacher profiles are visible to the other teachers in their Storypark community. Parents and family members can’t access a teacher’s profile. 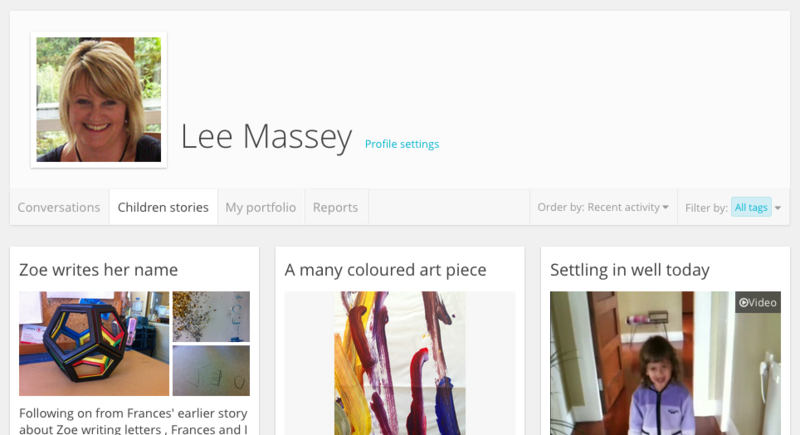 You can access your own ‘Teacher profile’ by clicking the "My portfolio" link under your name in the menu. To access another teacher’s profile go to your early learning service’s ‘Teachers’ page, and click on that teacher’s name. 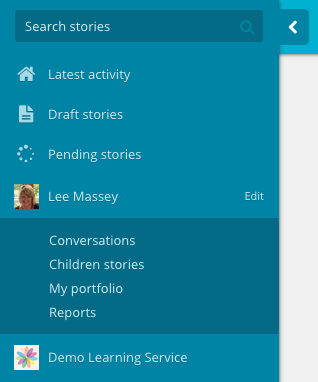 A teacher profile area has four parts: ‘Children stories’, ‘Conversations’ and 'My Portfolio' and 'reports'. Click the ‘Children stories’ link to see all the stories that a teacher has written about children at your early learning service. Clicking the ‘Order by:' button will show you a drop-down menu with various ways to arrange the stories on that page. View the story order by ‘Recent activity’ (stories with new comments appear first) or by ‘Story date’ (date published). You can filter stories on this page by the learning tags in them. Click on the ‘Filter by:’ button, and then on any tag in the list to only see stories tagged with that learning tag. One potential use for this is to view a list of the tags that have been used in that teacher’s past stories so you can see where any gaps are and develop capability in future stories. Click the ‘Conversations’ link on a teacher’s profile page. A teacher’s ‘Conversations’ page is where teachers can reflect on ideas, goals, assessment, documentation practices etc and have conversations with other teachers about them. Note: you will only see the conversations that you are added to, and those you created. Other teachers (eg. a head teacher) can offer their feedback by leaving comments or adding their own reflections for the teacher. Teacher's conversations are associated with individual teachers, not the early learning services they teach at. This means your conversations will remain accessible, and free, to you even after you've left your current early learning service. Learn how to create a conversation, here. A teacher can create or duplicate any story and save it to their portfolio. They can choose who can access their portfolio in their profile settings. Teacher's portfolio are associated with individual teachers, not the early learning services they teach at. This means your portfolio stories will remain accessible, and free, to you even after you've left your current early learning service. Learn how to create a portfolio story here. Learning trends allow you to select a time period that you’re interested in and reveal the learning tags that a teacher used in either their teacher portfolio stories or the stories they wrote for children.